ONLY 1 KITTENS REMAINING AVAILABLE-TAKING VIEWINGS TODAY 24/03/18 ****************** I UPDATE ADVERT OFTEN-I WILL CLOSE ADVERT WHEN KITTENS ARE SOLD AND TAKEN ****************** please text or phone i\'m not checking emails ****************** ONLY1 FEM kITTENs left & aVAILABLE OBVIOUSLY TO BE SEEN WITH MOTHER CAT! 1 GIRL REMAINING currently ~ 7 WEEKS OLD & 4 DAYS ~ COLLECTION FROM 21ST MARCH THESE KITTENS ARE HAPPILY EATING DRIED KITTEN BISCUITS, THEY ALSO ENJOY MEAT IN JELLY. 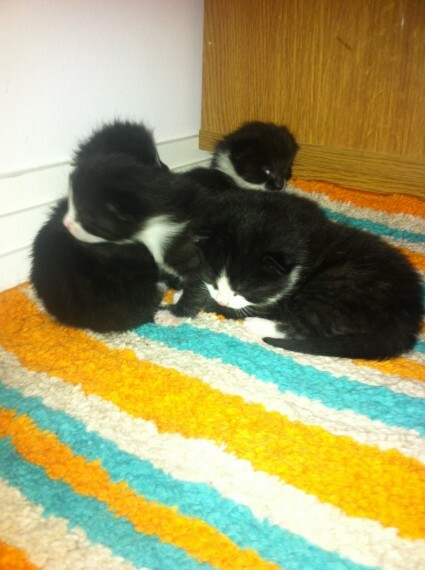 THESE KITTENS NEED WATER AS WELL AS SHOP BOUGHT KITTEN MILK (NOT COWS MILK-WILL GIVE THEM UPSET TUMMY AND LOOSE POOPS) THESE KITTENS ARE FULLY LITTER TRAINED. THESE KITTENS HAVE BEEN PRECAUTIONARY TREATED AT HOME HERE WITH WORMING TABLET AT 6 WEEKS. THEY HAVE ALSO HAD A FLEA FRONTLINE WHICH WAS ALSO PRECAUTIONARY. REALLY DELIGHTFUL KITTENS, VERY SOCIAL, GREET YOU AT FRONT DOOR UPON COMING HOME. THEY ENJOY FUSS AS WELL AS QUIET REST TIMES. THEY HAVE BEEN ADORED AND PLAYED WITH BY OUR CHILDREN AGED 12/10/8. THEY HAVE BEEN CUDDLED BY US GROWN UPS TOO! TOYS FOR THEM ESSENTIAL, TO OCCUPY THEM AND HELP THEM LEARN CAT STUFF! PLEASE TELEPHONE FOR APPOINTMENT TO VIEW, I DO NOT WISH TO STRESS KITTENS AND WILL TAKE ONLY 3 VIEWINGS PER DAY. I WILL ASK YOU QUESTIONS AS WELL AS YOU ASK ME DURING THE APPOINTMENT TO VIEW. IF HAPPY WITH PHOTOS, OR WOULD WANT TO BUY IT AT VIEWING THEN YOU WILL NEED 200 CASH, AND KITTEN EQUIPMENT IE; FOOD BOWL, LITTER TRAY, TOYS, SAFE CAT CARRIER FOR TRANSPORTATION. THE CAT CARRIER WILL BE MORE COMFORTABLE WITH A BLANKET OR TOWEL, INSIDE! I WILL NOT ALLOW A KITTEN TO LEAVE MY HOME WITH OUT A SAFE CARRIER.